We were pleasantly surprised in early January when Vivian a generous donor came in with home-made pet blankets asking us if our clients might need some! Through the Armed Services, she has served her country in many capacities including working at hospital units as a phlebotomist and Emergency Medical Technician, and in patient accounts and medical billing as a civilian. She has a strong desire to help veterans in any way she can because of the experiences she’s had with her colleagues and friends who also served. (She doesn’t want to talk about details in the armed services…) *. She also has been employed in the retail sector and is working now as a customer service representative. She enjoys this work because she gets to interact personally with customers and clients. About ten years ago, Vivian moved to Albuquerque from Atlanta, Georgia and fell in love with the mountains here. She enjoys hiking and surrounding herself in the beautiful landscapes of New Mexico. She also takes pleasure in photographing the multifaceted scenery here. Vivian learned to sew from her mother, who often stitched outfits for her entire family. Vivian followed suit as a child and began crocheting, knitting, and sewing outfits for her Barbie dolls. Later on, she sewed her own clothing as well. When she learned about Meals on Wheels’ LIFE (Low Income Food and Enrichment) and Love on a Leash programs, through another one of our volunteers, and about how clients in these programs are poor, sick, and home bound, she knew she had to take action. She began designing and creating blankets for our clients and their pets. But Vivian is not done yet! She desires to continue making these blankets and branching out to include a blanket for larger dogs and dog jackets. She had only designed blankets that were suitable for small and mid – sized pets. She is now designing a special blanket with larger dogs in mind that can be useful in both the colder and warmer climates! Vivian only seeks out quality materials for her blankets. She chooses colorful, locally-themed (such as hot air balloon prints). ), and universally patterned textiles, and then finds a matching solid color for the reverse side of the blanket. 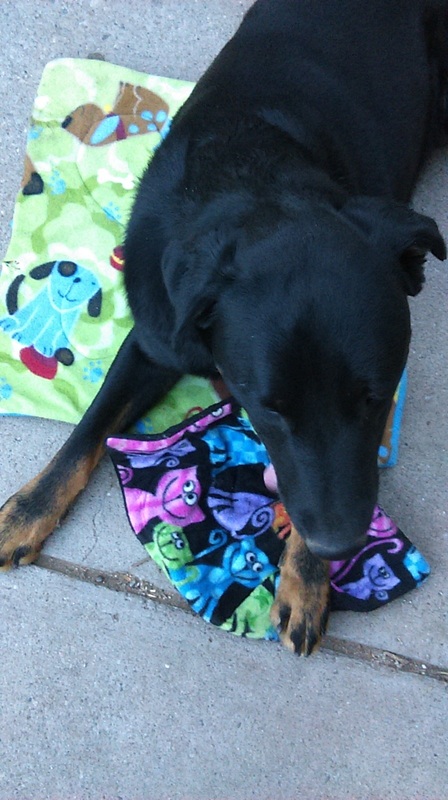 Vivian designs these blankets so they are incredibly durable, withstanding regular machine washing and wear and tear. 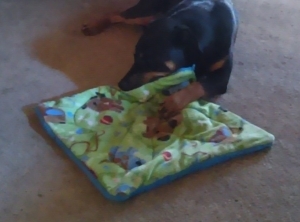 She even has her friends and their pets test out the blankets to ensure the design she has created is long-lasting and permanent. About 40 of our LIFE program clients have been blessed with her creations, and approximately 100 blankets have been distributed to our clients and their pets. When we told Vivian about the many phone calls Meals on Wheels received from our clients thanking her for the blankets, she was thrilled! We are equally thrilled that Vivian has chosen Meals on Wheels to donate her one-of-a-kind, compassionate creations. Thank you, Vivian, for warming the hearts and spirits of our city’s most vulnerable.